What Would a Zombie Brain Look Like? What Would an Undead Brain Look Like? Like love and marriage, and like peanut butter and jelly, zombies and brains go together. Anyone performing an even half-reasonable zombie impression must include the groaning word, "braaaaaiiiiinns." But why do zombies crave brains the way they do? And what's happening in the zombies' own brains? Researchers Bradley Voytek, Ph.D., and Tim Verstynen, Ph.D., are members of the Zombie Research Society, a lighthearted organization devoted to applying real neuroscience to explain the fictional zombie brain. They approach the zombie brain like neurologists approach any patient: by noticing signs and symptoms, then figuring out what areas of the brain must be damaged to create those neurological problems. As the researchers make clear, and I'll reiterate here, this exercise is not intended in any way to belittle the symptoms of those suffering from neurological disease, or to call the victims of that disease "zombie-like." Instead, it is an effort to encourage thinking about these disorders, and to increase understanding of the underlying problems. Have you ever seen a happy zombie? No, the zombies in movies usually snarl like angry drunks and are probably perpetually suffering from a similar kind of primal, uncontrollable rage. The prefrontal cortex is a region of the brain that controls emotions, and some studies of violent criminals have shown abnormalities of this region. The famous case of Phineas Gage involved a mild-mannered gentleman who suffered an accident to this region of the brain and became more rude and coarse. Perhaps zombies suffer a similar neurodegenerative fate. Although they are sometimes called the "walking dead," zombies don't walk so much as they lumber or lurch. Zombies are not the picture of grace. The zombie walk is most akin to an ataxic gait that can be seen with damage to the cerebellum, a cauliflower-shaped structure at the back of the brain. But what about fast zombies, as seen in the movie 28 Days Later? In this kind of zombie, the cerebellum is likely more intact. Zombies frequently seem to be easily distracted. It may be that zombies have a kind of anterograde amnesia. This syndrome was depicted in the movie Memento and was experienced by an actual patient called H.M. after both of his hippocampi were surgically removed in the 1950s, in an effort to stop his seizures. The result was an inability to remember anything for more than a few minutes at a time. A particular vitamin deficiency can lead to Wernicke-Korsakoff syndrome, which is characterized by similar memory losses. Zombies are not great orators. At best, they may longingly utter, "brains." Furthermore, zombies don't really seem to understand commands like "stop" or "no." A neurologist might say that zombies suffered from an expressive and receptive aphasia, meaning they are unable to produce or understand language. This likely reflects damage to the dominant hemisphere (the left side in over 90 percent of people), including Wernicke's region for receptive aphasia and Broca's area for expressive aphasia. How is it that zombies don't recognize people with whom they were previously close? Instead, their former friend is now seen as lunch. Maybe zombies are delusional: they unshakably believe something that just isn't true. An example is a Capgras delusion, in which someone familiar is believed to have been replaced by a lookalike imposter. Perhaps zombies have something similar that permits them to see a human form, but not recognize that body as being someone previously close to them. No matter what you throw at a zombie, the zombie just keeps coming. It doesn't matter if a zombie has been shot, lost an arm, and set on fire—it will keep coming. How do they do it? Perhaps zombies no longer perceive pain. The neuroanatomy of pain is complex, but it includes the somatosensory cortex in the parietal lobe, a region involved with all physical sensations. Regions such as the insula and cingulate cortex attach a negative connotation to pain. Since zombies never seem to have an emotional response to their own pain, Dr. Voytek and Dr. Verstynen posited that it's this second pathway that is most affected in zombie pathology. Zombies then could technically feel pain, but they just wouldn't care about it. Zombies have a tendency to fixate. When chasing you, they are oblivious to everything else. If something can tear their attention away—such as the fireworks used in George Romero's Land of the Dead—you are temporarily safe, as the zombies seem to temporarily forget your existence. The inability to pay attention to more than one thing at a time can happen with injuries to the parietal lobe. Alternatively, disruption of the underlying connections between these lobes could result in this disability. A zombie's need for human flesh is an unstoppable desire. The zombie will move through fire, water, and unspeakable cold, risking limb and what-passes-for-life—all to feed its unquenchable hunger. These behaviors are similar to a drug addict in need of her next fix, and likely involve the same pathways in the brain. Dopamine-releasing cells send branches that exit the midbrain and travel through to the nucleus accumbens at the front of the brain. This path is also hyperactive in the early stages of romantic love. Zombies love to eat. In fact, no matter how many of your friends or family members a zombie has already consumed, there always seems to be room for you, too. This may result from a problem in the hypothalamus, the part of the brain that controls basic drives such as hunger, thirst, temperature control, and sleep. The ventromedial nucleus of the hypothalamus controls satiety, the feeling that enough is enough. If this structure was damaged, the zombie would never feel full. An alternative explanation is a temporal lobe. Damage to the right temporal lobe, in particular, seems to be associated with a tendency to overeat. In conclusion, a zombie brain would be missing most of the regions of the brain known as association areas—that is, the regions in which we put higher thoughts together. In theory, these are the regions that contribute to our human consciousness. Many of the structures implicated are part of the circuit of Papez-a neuronal circuit outlined over 75 years ago and thought to be associated with emotion and memory. It's conceivable that an infectious agent, such as a virus or prion that spread through these regions, could produce a syndrome very much like CDHD. 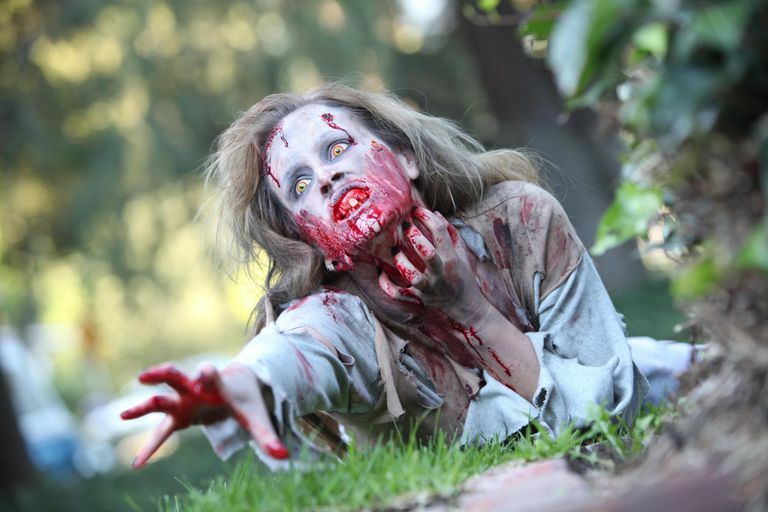 Dr. Voytek and Verstynen are not the only researchers interested in how zombie brains function. Others, such as Dr. Steven C. Schlozman at Harvard University, have also written on the subject, and agree on the likely degeneration of the frontal lobe and cerebellum. Dr. Schlozman prefers the term Ataxic Neurodegenerative Satiety Deficiency Syndrome (ANSD). Whether you call it ANSD, CDHD, or just zombism, the point is that while such a syndrome is unlikely, it is not impossible. If certain areas of the brain were to be destroyed—perhaps by an infectious agent like a virus or prion—the victim could behave in a manner similar to a fictional zombie. Of course, this is not the same thing as bringing back the dead. But the goal of these projects is a different kind of revival: the aim of the Zombie Research Society is to inject some life into a subject too many people mistakenly believe is deathly boring, and to thereby revive interest in neuroscience through the brains of the undead—not to mention having some spooky pop-culture fun as well. AH Ropper, Samuels MA. Adams and Victor's Principles of Neurology, 9th ed: The McGraw-Hill Companies, Inc., 2009.